The Crane CC Radio EP PRO is an enhanced version of the original EP. It has the same simple controls and the same high performance with superior selectivity and sensitivity. 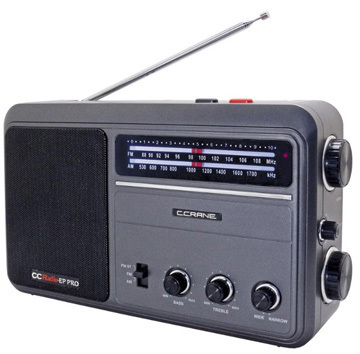 The portable CCRadio-EP PRO could be considered a super radio; built for ease of use and outstanding long-range AM with the C. Crane patented Twin Coil Ferrite® AM Antenna. FM performance is excellent. This radio is great for listening to Talk Radio, NPR®, Music, and Sports. The EP PRO has a wide bass and treble adjustment range for defined music and accurate and lively voice reproduction. A large, 5-inch speaker is combined with a hi-fidelity amplifier and a "Wide/Narrow" enhancement dial to give extra clarity to AM programs. The dial accuracy of the new EP PRO is superior to the original model and a button on top of the radio engages the dial back-lighting. Size: 11.4" W x 7.3" H x 2.75" D. 4.5 lbs. (without batteries). It operates from an included AC adapter (6VDC 800 mA [-]) or from four optional "D" batteries (not included). The back panel features a spring-loaded AM band antenna terminal and an "F" type jack for FM band.